Ask fellow campers about "Mountain Shadows Campground" and nearby attractions. May 2018 was our second stay here, and we love the place. Close to town, lovely forest, solid wifi if you're close to the office (site #8 two years ago wasn't as solid as this year's #1), clean facilities, and a huge network of beautiful hiking trails (almost 200 km of them in total). We live a quiet rural lifestyle and didn't even notice the highway noise last night, but on my walk this morning I did notice that the sites along the highway side of the loop are substantially noisier. We camped at Mountain Shadows Campground in a Motorhome. The sites on the highway side of the campground loop are substantially noisier from Highway 3 traffic. The sites are treed and reasonably separated from one another. Our site was level, and the others looked to be the same. Personnel were friendly and helpful. Wifi worked well for us, but we were only three sites away from the cabin. A passing camper returning from the showers remarked that they were clean. The main downside to this campground is the proximity to the Crowsnest Highway: some sites actually back onto it. It was noisy at times, but not, fortunately, in the middle of the night. We were there for an overnight, and would stop again for the same. We camped at Mountain Shadows Campground in a Travel Trailer. A decent place to stay. The park could have been a little cleaner. Small amounts of trash in the camp sites, cigarette butts, bread ties etc. The WIFI is really only usable right around the office building. We camped at Mountain Shadows Campground in a Travel Trailer. Visitors centers in both Fernie and Sparwood. We spent time, and money, in both cities. A pleasant surprise hidden in the mountains off RT 37. Spacious sites, nearly level with great views of the lake and mountain range beyond. Owners are very helpful (been there 24 years). Walk down to the lake and sit on the bench and relax. quiet,wonderful view. We camped at Mountain Shadows Campground in a Motorhome. Walk down to the lake. The property is apparently owned by another party and part of the lake serves as a private seaplane port. This was a beautiful rv park! It reminds us of our beautiful national parks in the US, but it has full hook ups. There are many beautiful trees and lots of trails to hike. The sites are rustic but very spacious. They have many pull thru sites. I used the word beautiful 3 times, because it is definitely a beautiful park!! The park was run by a non profit group that donates all the proceeds into the city. We camped at Mountain Shadows Campground in a Motorhome. Close to Fernie where there are cute shops and restaurants, ski resort and provincial park. This park is located south of downtown with easy access off the highway. Friendly staff with quick registration. Our site (#17) was a gravel back-in surrounded by trees. It included a picnic table and fire ring. Hookups were midway and all worked fine. No cable or OTA TV and satellite not possible due to trees. Campground Wi-Fi was fairly slow, so reconnected to a Shaw open channel and the bandwidth was good enough for streaming. Dump station and garbage at the exit. We would stay here again if in the area. We camped at Mountain Shadows Campground in a Motorhome. A lovely campsite. Close to the highway, but fairly quiet all the same. 15 amp power but lots of oomph. Water connection at the sites. Rinse water at the dump station. It is operated by the Town. Fire wood was provided, as are picnic tables. I would camp here again. 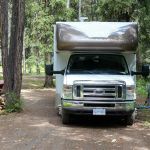 We camped at Mountain Shadows Campground in a Motorhome. Large sites for most campsites. We kept a 27' trailer and boat side by side on our site. A few pull-throughs are available. Near Highway 3 so not as quiet as some campgrounds but night time traffic was lighter so did not bother us. It is a community run campground so is in good condition and office staff were very friendly. Would stay there again. We camped at Mountain Shadows Campground in a Travel Trailer. Clean restrooms, spacious sites but limited full service. Good community run park. Free firewood in abundance which is definitely a plus given that other campgrounds charge $$ for a very small bundle. Would visit again. We camped at Mountain Shadows Campground in a Travel Trailer. Friendly, clean wooded site. Bathrooms clean and serviceable. Family and pets welcome. A good camping experience, we will be happy to return and give Mountain Shadows a good recommendation. We camped at Mountain Shadows Campground in a Travel Trailer. Nice "transit" spot. Pull through sites with good privacy, lots of trees and friendly people. Long term tenants were plentiful, but very friendly. We camped at Mountain Shadows Campground in a Travel Trailer. Excellent community run campground with huge sites. Ours was adjacent to the highway, but plenty of trees and brush for privacy. Also, the highway isn't highly traveled. Good playground on site. Lots of eating nearby. One of the more enjoyable stops on our trip. We camped at Mountain Shadows Campground in a Fifth Wheel. Great campground, we usually usually make a point stay a couple of nights whenever we are passing this area, nice big treed sites, always lots of firewood available and access to a nice little 4k hiking trail. They now have Wi-Fi although you need to be close to the office to use it We camped at Mountain Shadows Campground in a Fifth Wheel. This park consists of well separated sites in a wooded area. It is close to the highway but there is little traffic at night. The sites are long and reasonably level, the washrooms are very nice. Great spot if you prefer "camping" instead of a paved RV park. We camped at Mountain Shadows Campground in a Motorhome. Hi, A wonderful community run Campground. It's lacks are wifi and a pool. $26.50 was for water, sewer, and 30 Amp ac power. Free firewood! I'd stay here again in a flash! We camped at Mountain Shadows Campground in a Motorhome. Are you affiliated with Mountain Shadows Campground ?